Pamyua’s Phillip Blanchett will be opening the show with an unplugged preview of his solo music. His music is a blend of Indigenous perspectives served with neo-soul influence. Similar to Pamyua, Phillip’s music is personal and celebrates identity. Two creatures, a monkey and a bear, have just escaped from a life of captivity. As the creatures emerge into a world that is unfamiliar, they cope with their transition in divergent ways. This tension is embodied by the distinction between the show’s two primary circus disciplines (slackwire and trapeze). One creature ascends into a world of myth and madness while the other treads a line of reality and human socialization. The two creatures try to maintain their connection to each other as their paths diverge, ultimately watching their bond unravel until a single string remains. A System of Strings is about the ties we use to maintain our connections--the lines that anchor us to our relationships, our identity, and even our sanity. The show explores the duality in these links, utilizing the contrast between the members of the two-person cast and the circus acts they choose to pursue. 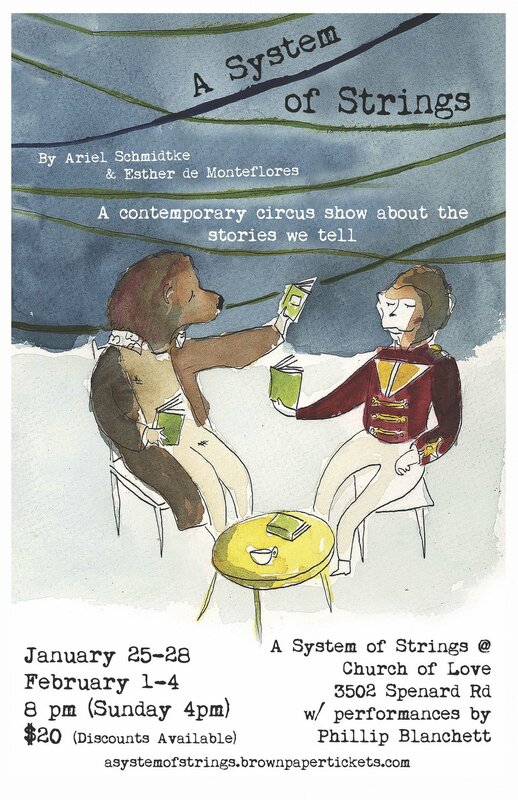 Inspired in part by the contrast between lightness and darkness in the Alaskan winter, A System of Strings brings light to the stage through shadow puppetry integrated with circus arts. This show occupies traditionally unused spaces in a theater, starting in the lobby and ending among the rafters, creating an immersive experience for audiences. Esther de Monteflores is an American circus artist, physical performer, and choreographer. Esther is one of a tiny handful of circus performers in the USA specializing in slackwire walking and is the recipient of a 2017 Fellowship in Performing Arts from Artist Trust (Seattle, WA). Esther's unique take on circus has been seen across North America. Some of her credits include The Luminaria Contemporary Arts Festival (San Antonio, TX), The Chicago Contemporary Circus Festival (Chicago, IL), Moisture Festival, (Seattle, WA), Art on the Atlanta Beltline (Atlanta, GA), and Wise Fool New Mexico (Santa Fe, NM). In her work, Esther seeks a balance between technical skill and expressive movement. Circus arts allow her to create work that is both intimate and spectacular, using the inherent element of risk to focus attention and spark imagination. Ariel Schmidtke is an interdisciplinary physical performer and multimedia artist. With roots in the Pacific Northwest and influences ranging from Southern Gothic to French Nouveau Cirque, Ariel has traveled extensively to enrich her approach to circus dramaturgy. Inspired at a young age by gymnastics she began training as an aerialist with the Dream Science Circus at the age of eighteen. She is drawn to the nonverbal expressiveness of gestures and to diversify her performance skills she has spent the past ten years studying dance, theater, puppetry, and contemporary circus. Single Point Fixed Trapeze: Unlike the more common flying trapeze, the fixed trapeze is a static apparatus. Performers move on the apparatus while it stays in place. The single point allows for the trapeze to rotate, allowing audiences to see the movements from various angles. Slackwire: Slackwire is a traditional circus apparatus which is essentially a completely loose tightwire. The slackwire truly hangs slack, allowing for a unique and challenging style of movement integrating aspects of wire-walking, dance, and aerial arts.